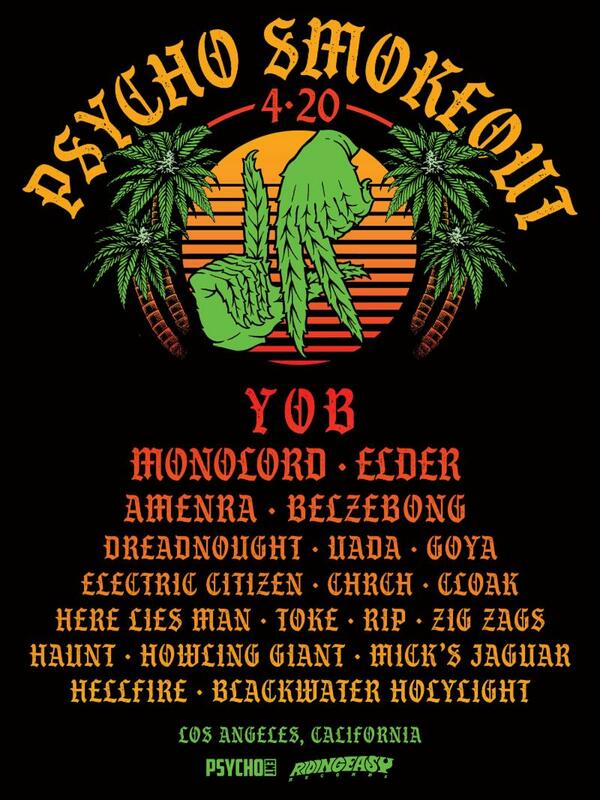 Already featuring a smoking lineup of some of doom, stoner, and psychedelic rock's most revered acts, the first annual PSYCHO SMOKEOUT is pleased to welcome Oregon doom titans Yob to the glassy-eyed gala. Currently wrapping up a North American tour supporting their critically-lauded Our Raw Heart full-length, Yob will share the stage with the likes of current tourmates Amenra, Monolord, Belzebong, Chrch, Electric Citizen, Dreadnought and over two dozen others, closing out the epic, day-long celebration of reefer and riffs. 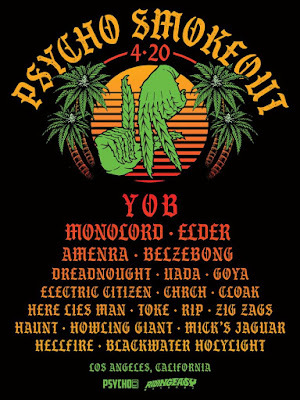 Brought to life by Psycho Entertainment and RidingEasy Records, PSYCHO SMOKEOUT will make its descent upon the historic Catch One nightclub in Los Angeles, California on April 20. In addition to twelve hours of live music, the eight-room compound will include the Riding Psycho Vendor Market, psychedelic virtual reality installations, a twisted stoner Cannabis Carnival where prizes include smoking accessories, meal tickets and more, a Tinker Shop featuring world renown glass artist Dwreck who will perform an open-flame demo while Dunable Guitars shows their process of building a guitar (both artists will be raffling off a commemorative Smokeout piece, valued at over $3,000), the Smokeout Saloon featuring Burlesque shows by Portland's Devil's Point and so much more.